Diva from Lutron is a simple and elegant solution designed to match your existing designer opening switches and accessories. This Diva is for use in 1000 Watt, single pole applications, where the lights are controlled from one switch. You can easily turn the lights on and off with the paddle style switch. While the lights are turned on, use the slide control to adjust the lights to your desired level creating your perfect light. The paddle switch returns the lights to your favourite preset level. Installing a Diva dimmer is easy and saves energy too. You can replace your existing switch with a Diva dimmer in as little as 15 minutes. Coordinating Claro wall plates sold separately. 1 year warranty. For more information please contact 1-800-628-0525. Renu is the smart way to update the look of a room in a snap, now and later. Designed for do-it-yourselfers, the Renu collection includes GFCIs, switches, dimmers and outlets available in 20 colors to blend in or contrast with any decor. The devices have faces you can snap off and update to create a new look anytime. The latest addition to the collection is the REL06 Renu Universal Dimmer. This device was created specifically for seamless control of dimmable LEDs, dimmable CFLs, magnetic low voltage (MLV) loads and incandescent lamps. The Renu Universal Dimmer has advanced programming features to select load type, set minimum brightness level and adjust lighting fade rates. Renu fits your lifestyle and adapts to your changing taste. 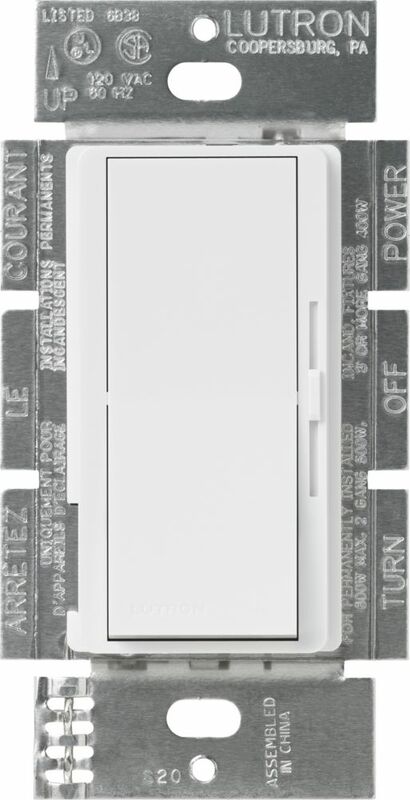 Diva 1000-Watt Single-Pole Dimmer, White Diva from Lutron is a simple and elegant solution designed to match your existing designer opening switches and accessories. This Diva is for use in 1000 Watt, single pole applications, where the lights are controlled from one switch. You can easily turn the lights on and off with the paddle style switch. While the lights are turned on, use the slide control to adjust the lights to your desired level creating your perfect light. The paddle switch returns the lights to your favourite preset level. Installing a Diva dimmer is easy and saves energy too. You can replace your existing switch with a Diva dimmer in as little as 15 minutes. Coordinating Claro wall plates sold separately.